You may think that you know all about the greatest natural landmarks of our planet… But have you heard about Airdevronsix icefall – 5 km wide and 400 m tall icefall? Airdevronsix icefall is located in one of the most exotic places of our planet – McMurdo Dry Valleys. This is one of the few places in Antarctica which is free of ice, with scattered frozen lakes where almost every lake has unusual chemical properties. These valleys are cleaned by the force of winds and belong to the most dry places of our planet. Numerous unusual natural landmarks are found here, such as the Blood Falls – red icefall which is colored by iron oxides and contains microorganisms from isolated subglacial ecosystem, which has developed for millions of years without contact to the outside world. Airdevronsix icefall has formed in location where the giant East Antarctic ice sheet pours (because ice is slow flowing liquid) in McMurdo Dry Valleys. Here a dolerite sill (intrusion of sturdy rocks) in Jurassic period broke through the Devonian – Triassic sandstone. This hard rock resists to the force of glaciers and as a result has formed this giant step with 400 m tall, vertical wall. Above the falls is located Airdevronsix Glacier but below the falls – Wright Upper Glacier. 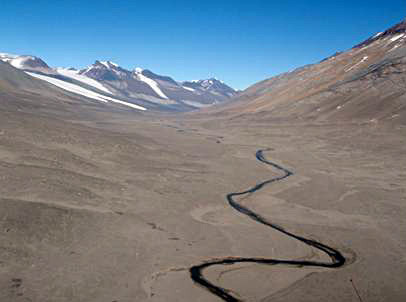 This lower glacier also is unusual: smooth, flat-topped, with a rounded shape, some 8.5 km long. Why is it smooth? Here falls down not just ice – also very powerful and persistent wind, the katabatic wind races down the valley and makes the Upper Wright Glacier smooth. Below this glacier starts Labyrinth – sombre labyrinth of canyons left by the subglacial streams which rushed under the glacier towards the daylight. Further down the valley are other natural wonders – Don Juan Pond (saltiest waterbody on Earth) and Lake Vanda with unusually lucid water (mostly frozen) and heated layer of brine under it. The unusual name – Airdevronsix – was given during the US Operation Deep Freeze in 1956 – 1957. This is a compound from "U.S. Navy Air Development Squadron Six". This sqadron carried out many important supply and exploratory flights. Snow and ice fall down along very tall, 5 km wide cliff in some six places. The widest fall is approximately 1 km wide. 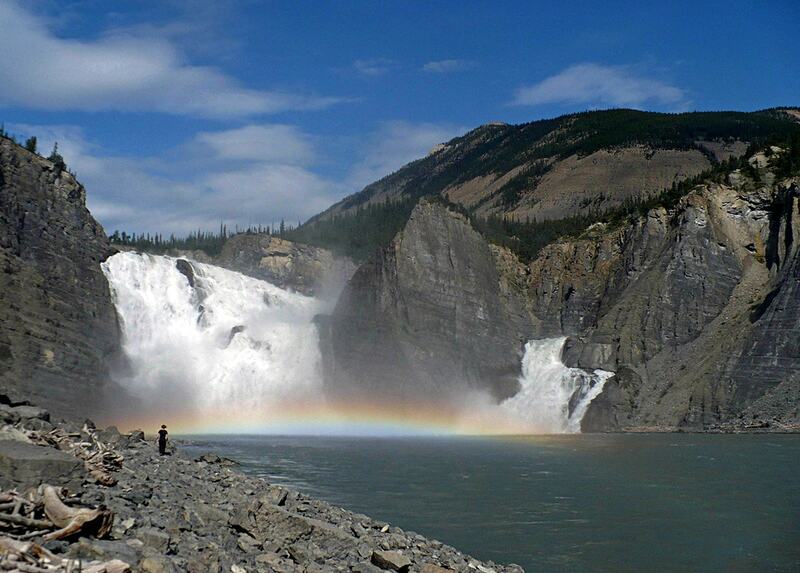 Upper rim of falls is at the height of 1,550 m above the sea level. Lower reaches of icefall are not even but in general are some 1150 above the sea level – thus the assumed height of icefall is approximately 400 m.
None of world’s waterfalls comes even close to this size. Further to the south-west, between Mt. Fleming and Mt. 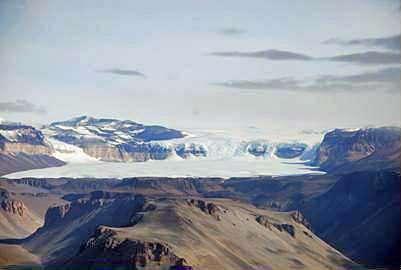 Baldr has formed another giant icefall – the 1 km wide Warren icefall. Those, who have seen Airdevronsix icefall, consider that this is one of the most magnificent sights on our planet. GigaPan image by Zbigniew Malolepszy, 2010. Fine image by Cole Kelleher from December 2011. Jackie Grom, Ancient Ecosystem Discovered Beneath Antarctic Glacier. Science, April 16, 2009. Antarctica is the only continent without permanent human habitation, yet it may hold the key to our survival. More than just a frontier for exploration, Antarctica is now understood to be a crucial part of a global climate and environment. Each year hundreds of scientists travel to the bottom of the world to investigate the climate, examine the continent’s hardy life forms, and seek answers to far-reaching questions about the universe.